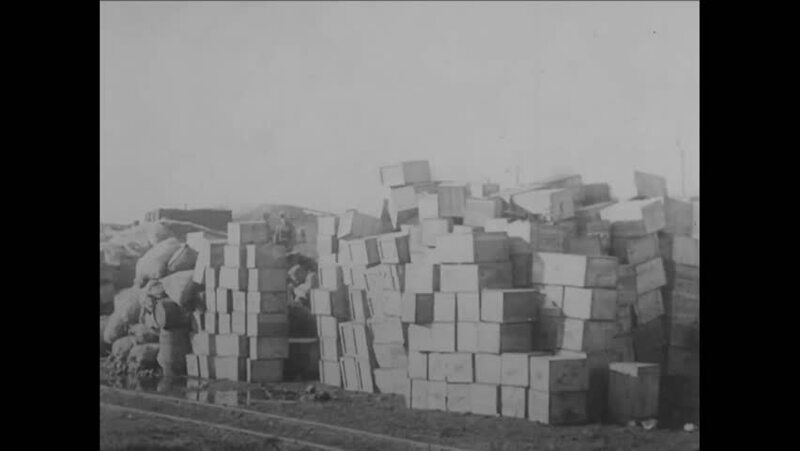 CIRCA 1918 - Soldiers unload provisions at a rail yard near Montfaucon. hd00:17United States, 1940s: Rocket on ground moves position. Man climbs down metal structure. Men carry equipment. hd01:49CIRCA 1910s - Soldiers board a ship, and military Generals have a meeting, with the Allied Expeditionary Forces in Siberia. hd01:23CIRCA 1937- German boys transport and store packages and cases of food at a Nazi Youth camp in New York. hd01:16CIRCA 1942 - US Navy sailors meet up with the British in Casablanca, and help load supplies onto their ships (narrated in 1945). sd00:14BEIJING - APRIL 01, 2004: WS Beijing skyline with thick, dense gray smog. Camera pans right. 4k00:22CONEY ISLAND 1920s: Men throw balls at metal containers, hands grab containers. Words describe thrill of sharpshooting. Men throw balls. Words describe thrill of flying. View far above city. hd02:32CIRCA 1950s - John Stapp sets a new world land speed record in 1954 riding a rocket sled.